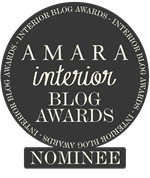 I don’t always make the trip up to Birmingham for the Interiors UK show. 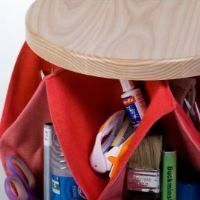 It tends to be quite samey, and often filled with stand after stand of products that I would never specify for a client. However, having read some of the marketing material for the show there were some new sections which sounded quite exciting. So, last Tuesday morning I got on the Virgin Express from Euston, and just over an hour later I was walking through the NEC doors. So, what are these new sections that tempted me up here? Well, there was the Designer Makers section, tucked away in Hall 1. 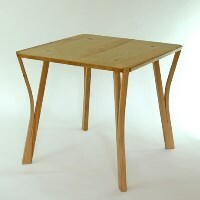 Here I came across the charming Angus Ross showing his beautifully elegant moulded, sculpted and folded wooden furniture, and Christian O’Reilly, whose simple furniture lines caught my eye. 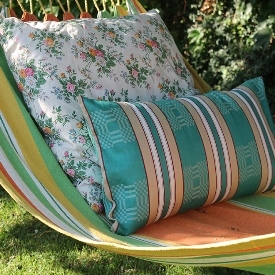 Both of these designer makers were also displaying Margo Selby upholstery fabrics on their stands, which was another plus point! I also spotted SOAP (Sum Of All Parts), whose quirky, different products caught my eye. 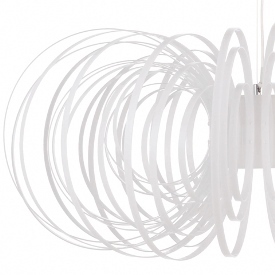 John Hollington for his Elica pendant light. 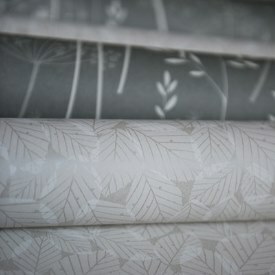 Joanna Hughes for her printed textiles. 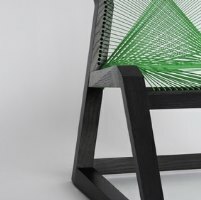 Alexander Mueller for his woven chair. 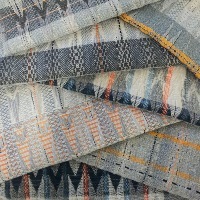 Clair Whyman for her woven textiles. 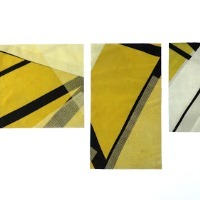 Seema Shah for her burnt surface designs. 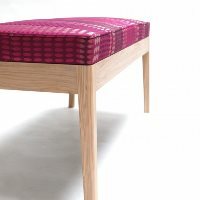 Elizabeth Ret for her clever ‘Pocket It’ stool design. 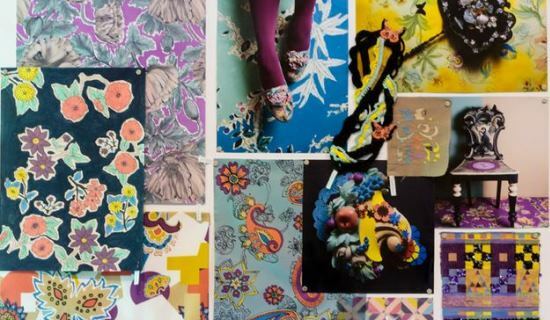 The Birmingham Institute of Art and Design (BIAD) had put together a great stand showcasing future trends, in partnership with Global Color Research. I also loved the Contract Spaces created by Out of the Dark and friends. 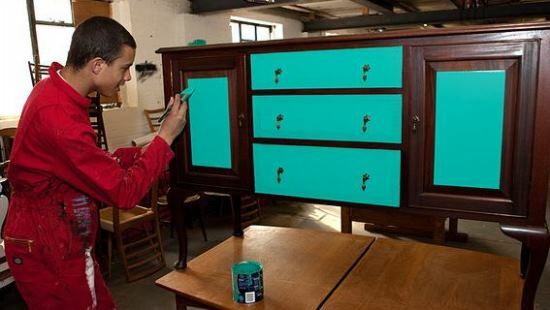 Out of the Dark is a social enterprise that recycles and restores salvaged furniture as a means to train, educate and employ young people from disadvantaged backgrounds. 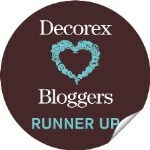 This organisation teamed up with four design companies to create originally designed roomsets that showcased some of the Out of the Dark furniture. 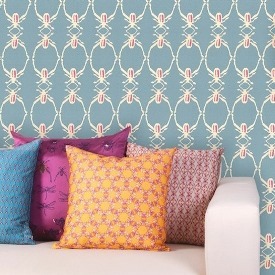 I picked up a rather fabulous design idea using Timorous Beastie wallpaper – perhaps for my own home, you never know! 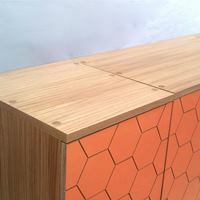 Designersblock also had a new section at the show, showcasing he work on 20 new designers. 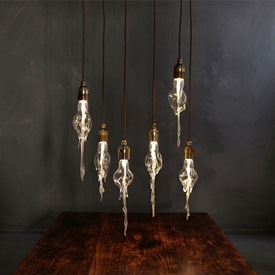 I particularly liked the work of Sboad with their intriguing ‘melting pendant’ but should also mention Laura Wellington, whose lighting designs have hit the interior design world by storm. 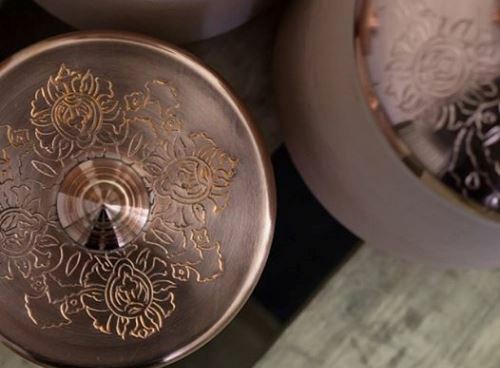 However, I think the product that stood out for me the most at the show, the one that jumped out at me and said ‘buy me’, were the simply stunning hand etched copper and terracotta pots by Hend Krichen! 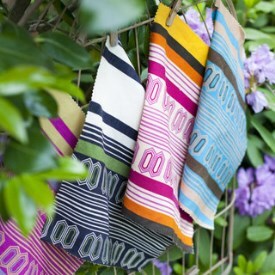 Hend has collaborated with local artisans from her Tunisian homeland to bring us these gorgeous accessories. I had quite a long chat with Hend and I love her philosophy in bringing these products to the market. So overall, well worth the trip up to Birmingham! What has caught your eye with the Interior show? As I said in my previous blog, 2014 has got off to a flying start, with the first trade show of the year being the Home exhibition last week, co-located with the new Craft exhibition. 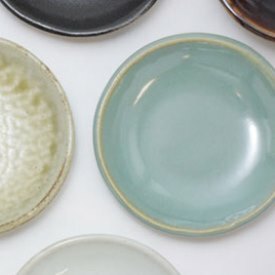 I was gutted when the Origin craft exhibition stopped, so I was thrilled to see a new outlet for British craft at this exhibition. 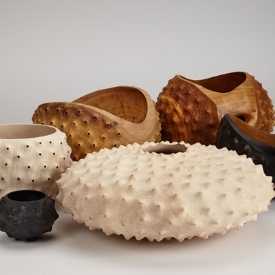 First off is Eleanor Lakelin whose stunning turned and carved wooden vessels really caught my eye. They look so naturally made, and I love their textures and shapes. These are definitely on my wish list! 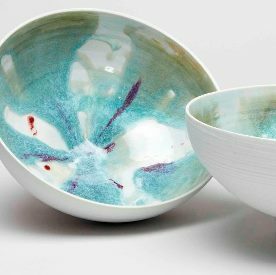 I also loved Victoria Bentham Ceramics with their intricate patterns combined with the delicate lustre on their torn edges. Then there was the delicate porcelain works of Normal Yap which really showcase the translucency of this material – beautiful. 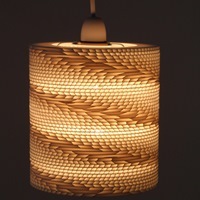 And, in contrast to that, heading over to the other side of the globe, I was drawn by Japanese pottery, Mashiko. 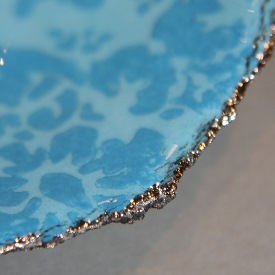 I love the tactile, earthy form and texture in this pottery! Of course I couldn’t go to an exhibition without keeping my eyes peeled for some African influences, and this little show didn’t fail to come up with some delights. 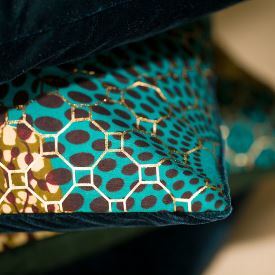 There was Dar Leone, whose owner Isatu Funna is influenced by Sierra Leone, and Arhinarmah, whose cushions, lampshades and furniture are filled with Ghanaian influences. 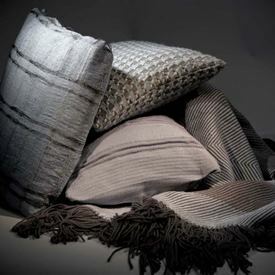 In total contrast to those bright hues are the beautiful textures and subtle colours in Jude Cassidy’s luxurious weaves, or the simple, earthy textures and splashes of colour in Ciara McGarrity’s Waffle cushions and throws. 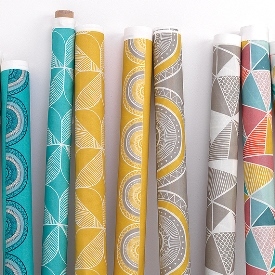 In fabric and wallpaper it was Arthouse Originals, with their East meets West fusion, and Clementine & Bloom, whose funky ‘entomology’ designs I adore. 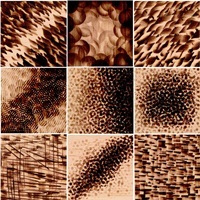 I really love the way both of these designers have played with pattern to create their designs. The story behind El Meu Coixí is fascinating! 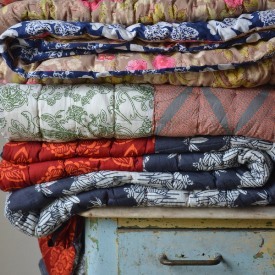 They came across a stash of 40-100 year old fabrics in an old Catalan factory that had closed years ago. 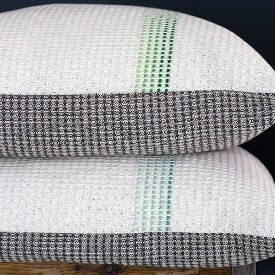 These fabrics were all in perfect condition, and El Meu Coixí is now using it to produce cushions. Talk about a find! 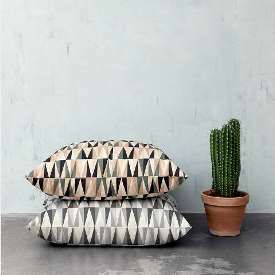 Quite a contrast to the new, graphic designs by Ferm Living! 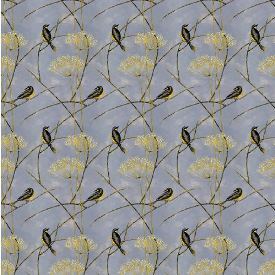 I was also taken with the muted tones of Hannah Nunn’s nature-inspired wallpaper as well as the vibrant pastels and bold patterns of Sian Elin’s fabric and wallpaper collection. 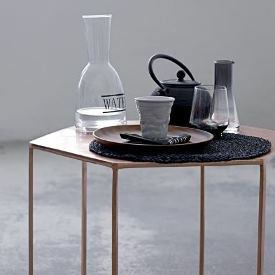 Bloomingville has a fantastic collection of homewares, including contemporary graphic designs, on trend copper products, hexagonal designs, natural wood, soft pastel hues, etc. 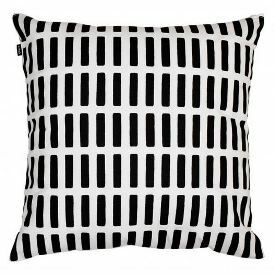 But, if Scandinavian monochrome is more your thing then the abc Collection from Finnish company Artek is for you. 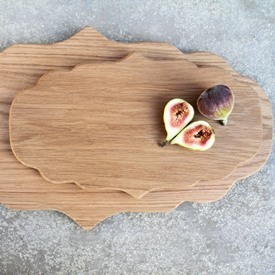 Hop & Peck create beautiful quality wooden wares such as these unusual shaped platter boards, and I loved the colourful block-printed Kantha quilts from Sophie Home – so beautiful. All in all a great little exhibition, with some exciting new finds. Will any of my selections make their way onto your wishing lists?